Chief Chinedu Arthur-Ugwa, the Chairman, Ohaneze Youths Council (OYC) in Bayelsa on Thursday urged members of the group to remain law abiding and peaceful across the nation. Arthur-Ugwa made the call against backdrop of a quit notice purportedly issued to Ndigbo by the Arewa youths to leave the northern parts of the country. Arthur-Ugwa told the News Agency of Nigeria (NAN) in Yenagoa that preliminary investigations indicated that the purported quit order had no basis and should be disregarded. “The leadership of Ohaneze Ndigbo under the leadership of Chief Nnia Nwodo is on top of the situation and there is no cause for alarm following assurances from northern leaders, our people have no need to fear. 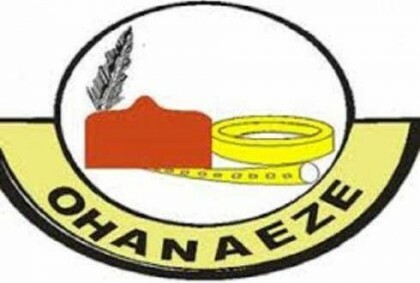 “In the coming days, the leadership of Ohaneze will take a position but we in the youth wing of Ohaneze urge our people to refrain from panic because there is simply no need for it. “The Ohaneze Ndigbo has been working tirelessly to strengthen the bond of unity amongst Ndigbo and their hosts across the country and that has yielded peace and harmony across ethnic divides. “Further assurances have also been given by the Minister of Interior, retired Lt.-Gen. Abdulrahman Bello Dambazau that there is no need cause for alarm,” Arthur Ugwa said. The youth leader noted that reports of the quit notice was a distraction to Ndigbo, who had a history of peaceful coexistence with their host communities in every part of the country.